When you first arrive to Barcelona’s El-Prat airport, you will have to find your way to the city center. Of course depending on your budget and timing, you can choose from different transportation options. Below are all the ways that you could get from point A to point B. Taking a taxi to the city center will cost around 25-35€, depending on exactly where you’re going. Now the pros are that they can take you to the exact place you need to go to, help with your luggage, are 24-7, and are overall the most convenient. But, if you have more time on your hands, or a lower budget, don’t worry. There are other methods of transportation that you can use. There is a metro station in the airport that can take you close to wherever you need to go. Of course, you might have to make a few stops or transfers, but it could be super convenient for you. As a point of reference, to get from the airport to Plaza de Catalunya by metro, it takes two lines and about one hour. The main issue with using the metro from the airport is that you are limited to the types of tickets you can buy. You are not able to buy the T-10 pass (which I recommend), and are charged 4,50€ for a one-way ride from the airport. You may also have to buy a 2, 3, or 4 day unlimited pass — whichever fits your plans better. The metro also runs from 5am to 12am Monday – Thursday, until 2am on Friday (Saturday morning), and 24 hours on Saturday (going on Sunday). In case you use the metro, make sure you know your nearest stop and how to get there. 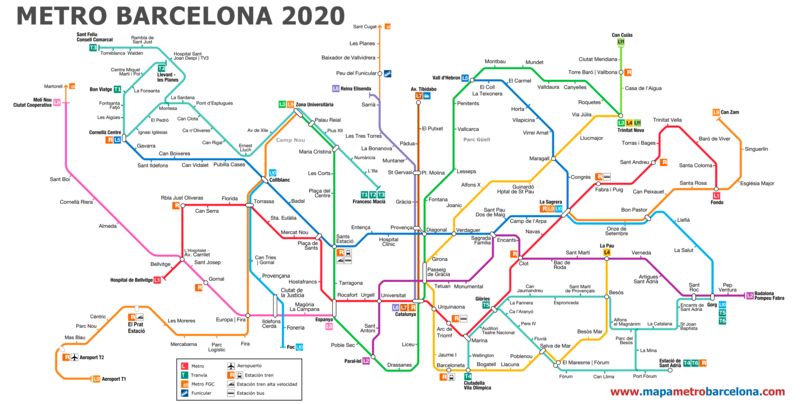 The airport line is the L9 Sud (the orange line) and connects with the L8 Train (pink line), L1 metro (red line) and terminates by meeting the L2 metro (green line which goes to Plaza de Catalunya) and the T1, T2, and T3 train lines. Honestly, this is the most complicated way in my opinion, but whatever floats your boat! Honestly, this is my favorite mode of transportation. It’s a bit more costly than the normal city buses (5,90€) but is cheaper than a taxi, takes around the same time as a taxi — if not faster — and has more comfortable seating and a specific compartment for luggage. The Aerobus runs every 10 minutes from 5am to 12:30am starting from Plaza Catalunya. If you’re coming from Terminal 1, the times are from 5:35am to 1:05am and if coming from Terminal 2, the bus runs from 5:35am to 1am. Just make sure you get on the right bus because one goes only to Terminal 1 and the other only to Terminal 2. This is the transportation option I recommend out of all of them. This bus can be picked up at the start of the line at Plaza d’Espanya and takes approximately one hour to get to the airport. It goes to both terminals as well which is handy. There are 23 stops in total, and runs Monday-Sunday from 4:50am to 11:50pm. So make sure to check the stops and map to plan your trip. This night bus runs to and from Terminal 1 only. The runs start from the airport at 9:55pm until 4:45am and from Plaza de Catalunya from 11pm to 5:00am — check for specific stops and times. From Plaza de Catalunya to the airport, it is about a 30-45 minute ride. If catching the bus from Plaza de Catalunya, make sure to get it where Rambla de Catalunya and Ronda Universitat meet, across the street from KFC. This night bus runs to and from Terminal 2 only. The runs start from the airport at 11:37pm until 5:11am and from Plaza de Catalunya from 11:30pm to 5:10am — check for specific stops and times. From Plaza de Catalunya to the airport, it is about a 30-45 minute ride. If catching the bus from Plaza de Catalunya, make sure to get it a little further up from the N17 stop, on Ronda de la Universitat, right in front of Ginos Italian Restaurant. There is also a train you can take from Terminal 2 to Passieg de Gracia, Barcelona Sants, or Clot. It runs every 30 minutes starting at 6am to 11pm, and accepts the T-10 pass (meaning it could cost only 1€). Since it only runs to Terminal 2, you would have to take a shuttle bus to Terminal 1 if that is where you are trying to go. There are various modes of transportation that you can take to and from the airport, making the trip easy to begin with. You don’t ever have to worry about being stranded in the airport or not having a way to get to where you want to go. So make sure you use the method that is most convenient for you! Next Post August Blogging Goals – One Month In! On our recent trip to Barcelona, we took a cab. I would do it again because it was such a cool experience to see Barcelona through the car window at night, windows down, with music as the cab driver pointed out landmarks and things we should do during our stay! This post is sooo helpful though because we took a cab because it was the only way we knew! It can be so confusing navigating and trying to find the best way to your hotel! I’m so glad you found it helpful! Maybe you can use another form of transportation on your next visit. But I totally understand what you mean about being able to see the city and having a more personalized experience — I’ve definitely taken the taxi far too many times until it hurt my wallet haha.